At Cheshire Decking we’ve spent over 20 years helping homeowners realise the full potential of their gardens by creating beautiful areas with a contemporary feel where they can socialise, relax and play. Everything we do is tailored to your specific needs. During our initial visit we’ll be listening hard to ensure we fully understand your requirements and ideas. Only then will we start to offer advice and develop solutions that meet your brief and work seamlessly with your existing outdoor environment. Whatever your project scale, complexity or budget, the solution we deliver will always reflect our creativity, our craftsmanship and the care we put into selecting the materials used because, ultimately, we only have one aim – to provide you with a fantastic new outdoor space to enjoy with family and friends. Cheshire Decking is led by Ian Graham who has been responsible for creating and delivering a wide range of beautiful outside spaces for over two decades. Ian’s approach to design is highly collaborative. From the experience and feedback received over many years, he knows that the very best solutions result from incorporating his creativity into your ideas, dreams and wishes. When it comes to the construction, Ian leads every project but will assign other resources from our tried and tested pool of specialists as and when required. Ian is also highly selective when it comes to materials - always looking to source and use the very best possible products based on your project design and budget. When it comes to creating great decking solutions it’s all about design, quality and finish - and at Cheshire Decking, we specialise in all three. The design of your deck is fundamental to the success of the overall project and we have all the creative expertise required to create a stunning solution in your desired space.Your deck could be curved or stepped; it could be multi-level and incorporate seating, storage and planting - and it could feature a wide range of integrated lighting. And perhaps there are solutions you’ve never even considered - how about a deck on your garage roof for instance? Or a deck used to bridge a damp or swampy area of your garden?The opportunities are endless, but whatever your needs, rest assured we’ll provide a solution that revitalises your space and works beautifully with all existing artificial and natural features such as bi-fold doors and trees. 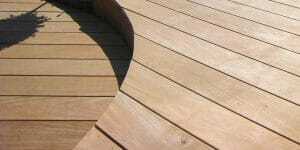 We work with all types of decking materials - everything from high-quality Hardwoods through to Softwoods and low or no-maintenance Composites.All the hardwoods we use are highly durable and long-lasting, have beautiful grain and colouring and are fully FSC-certified, making them perfect for decking and other garden structures. Ipe: from the rainforests of South Central America, this rich, dark wood is very strong and dense being three times harder than oak and very highly rated in all strength categories Yellow Balau: a Malaysian wood mixing golden, light and reddish-browns Iroko: from tropical Africa, this wood ranges from light yellow to golden-brown and darkens over time Garapa: a South American wood with a fine texture and rich golden-brown tonesIf the budget doesn’t stretch to Hardwoods, Softwoods still create fantastic looking decks while Composites are perfect for those seeking the ultimate in low maintenance. Once you’ve selected the ideal materials for your project, you won’t want to undermine the result by compromising on finish. At Cheshire Decking we strive to create the perfect overall appearance of your deck by incorporating items such as secret screw systems, stainless steel fixings, stylish railings and glass balustrades. 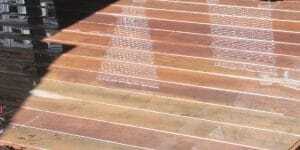 And, of course, we operate a comprehensive cleaning and resealing deck maintenance service to maximise the life of your deck and keep it looking great. If you need a bespoke area for your children to play we can design and build great wooden play areas to fit your available space. Always designed to be sympathetic to your garden, our play areas aim to enhance its aesthetics and utilise awkward spaces - and we can incorporate a wide range of great fun features such as stepping stones, rope walkways, balancing bars, monkey bars as well as the more traditional treehouses, swings and slides. We can even build in a ‘disguised’ trampoline! And if required, we can maximise safety by incorporating rubber flooring into the design. Apart from decks and play areas, we design and build a wide range of high quality structures to enhance your garden or other outdoor space. These include garden rooms and sheds, pergolas, carports and walkways – all in a high quality finish and, where relevant featuring materials such as cedar shingles, oak supports and cedar fencing. As you would expect, we undertake all the landscaping required to complete or complement our designs including brick walls, rendered walls, patios, pathways, water features, fencing, planting, turfing and lighting. This curved deck is made from Yellow Billau, with discreet perimeter lighting. The kitchen opens directly onto the deck, creating an open space. The garden is south facing, so the deck will be a real bonus come the summertime. This decking has been built with sweeping Cheshire brick steps leading into a broad Cheshire brick wall. The decking itself has been raised to the level of the banking at the end of the garden and allows for a fabulous view over the fields and woodland behind the house, a really peaceful place to sit and relax. The innovative playframe encases the trampoline and incorporates a den, swings and Twizzler rope swing - providing a lot of fun for active children in a small area. 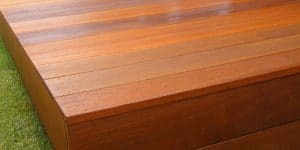 The deck is built from grade 1 Ipe and has innovative curved wooden steps to provide a real sense of continuity with the curved deck. Integrated planting area and mood lighting complete the overall look. Ian is a talented, professional and hard working landscaper with a real eye for aesthetics. We love Ian working for us. He has landscaped our back garden, crafting a particularly complicated curved decking area with inset lighting which is intersected by a circular decking area. Ian’s attention to detail has resulted in an extremely high quality decking and beautiful wood cladding on some hard landscaping at the rear of our property. Ian is brilliant at realising our ideas and making them work, or coming up with new ideas when alternatives are needed. We’re really delighted with the work Ian has done and would have no hesitation in recommending him and his team.